Microsoft Outlook is set of application services used to manage email, contacts, meetings and tasks. Business Computer Skills now offers Microsoft Outlook training classes in Savannah, GA. Get the professional training you need to take your Outlook skills to the next level. Whether you want to learn Outlook basics, become an expert with the application, we have the right course for you. Compare our pricing and variety of course offerings to our competitors like New Horizons, Netcom Learning, Certstaff and Ed2Go and you will see that Business Computer Skills is your best option. Self Paced Online Outlook Courses: - Our Outlook online training classes are perfect for students who are comfortable with self-directed learning. The self-paced classes cover similar material as the instructor led courses, and are accessable to students 24-7 for a 6 or 12-month license period. 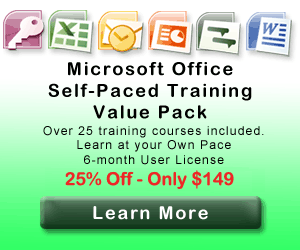 Microsoft Office Value Pack (Best Deal)!! !